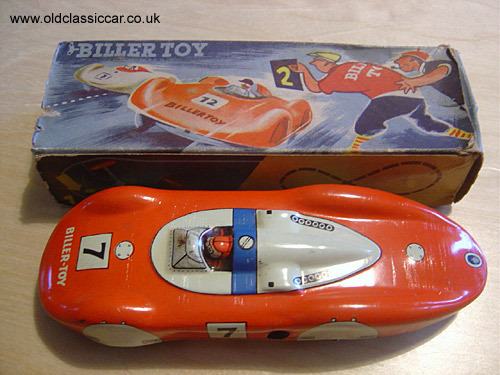 In the years after the war Germany became well known for some superb tinplate toys. Pictured above is a clockwork model Auto Union from Biller Toy with its original box. The steering can be set with a small lever below, and this, coupled with a small 3rd guide wheel, means that this car can do one of two pre-set courses. The first position allows the car to run a figure of 8 unaided, whereas the other does some joined up, circular, routes. All very clever. This one looks like it has hardly been played with. The lithography is lovely and crisp on this example. Colour: red and white, silver base, wind-up clock work motor and steering.